ITC Blair font family was originally crafted by Jim Spiece in the year 1997. 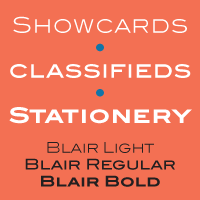 It is a contemporary, flexible version of the Blair font initially designed and released in the year 2000 by the Inland Type Foundry. The upper case letters of sans-serif are wide. It works towards offering the font a panoramic feel.